It hasn’t been the best of times for The Simpsons. Oh sweet Jebus, let’s just say it: it has been the very blurst of times. Yes, the show still rakes in the big bucks and yes, while it continues to do so FOX will probably renew it into oblivion. But there’s been something painfully off about The Simpsons ever since the seasons hit double digits. These more recent outings, led by current showrunner Al Jean, have been called forgettable, lazy and disappointing. So how does Season 16 measure up? Whilst Season 16 is a new DVD release, it’s also rather old. Eight and a half years old, to be precise, having run from 2004–2005 originally. The boxset itself is neat and well packaged; just like the previous four or so Region 2 releases, the producers have themed the box around a specific character. In this instance it’s everyone’s favourite bucktoothed science whizz Professor Frink, who gets a starring role in a couple of episodes. The first of which is the season opener, Treehouse of Horror XV, containing a thrillogy of memorable but not exactly groundbreaking features. The best of these shorts is “The Ned Zone”, in which Homer’s god-fearing neighbourino uncannily foretells how people will die. After saving Hans Moleman from falling to his death, he has a vision of him being eaten by alligators. In complete shock, Ned drops Moleman – yup, you guessed it – into an open manhole with alligators circling in the water beneath: “Another setback”, Moleman groans, just before he’s hacked to bits. It’s a predictable episode on the whole but it’s full of classy one liners (Frink’s “Let the commencement beginulate!”), getting the season off to a surprisingly good start. Frink’s other big turn is in Future-Drama, the show’s 350th episode. As Bart and Lisa stumble into his basement, he shows them a time machine that (he claims) can predict the future. Guest starring the voice of Amy Poehler as teen Bart’s girlfriend, Frink shows the kids a world where Milhouse is muscly, Cletus is the Veep, and America is contemplating giving apes the vote. 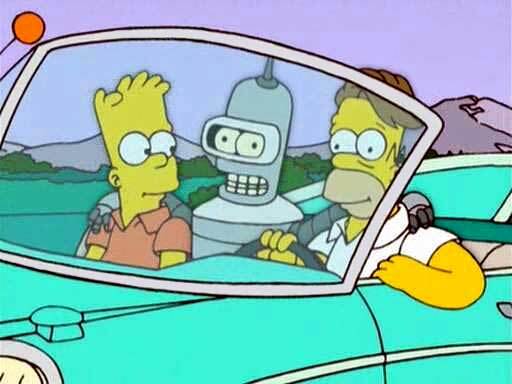 The Simpsons’ attempts to go into the future have always been hit and miss (think of Bart to the Future, Lisa’s Wedding, etc. ), and this is no different, desperately trying to strike a balance between plot and gags. In between all of this, Futurama’s Bender somehow makes it in for a fleeting cameo. In short, it’s all a bit jumbled and rushed. Pranksta Rap, Sleeping With the Enemy and Mobile Homer are some of the season’s more redeeming episodes. In Goo Goo Gai Pan, when the Simpson family flies to China to help Aunt Selma adopt a baby, there are jokes a plenty but it ultimately falls flat. Robert Wagner’s turn in a Troy McClure infomercial is funny enough, as is a fortune cookie gag: when Selma’s baby is taken away because they find out she isn’t married, Homer notes that fortune cookies are far more accurate in China. He unrolls the paper: “We will take Selma’s baby”, it says. When the jokes are good, they can be really good: “No one’s gay for Moleman”, for instance, and Homer’s chanting of “blood for cream” in All’s Fair in Oven War. But if there’s one thing to say for the season as a whole it’s that, quite unsurprisingly, it is not in the same league as early Simpsons. And for that: Boourns. The Simpsons season 16 is out on general release, £26.00.